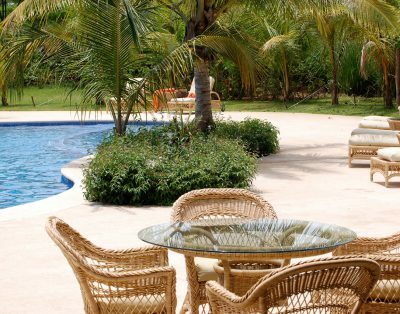 Now for rent in Hacienda Pinilla Beach and Golf Resort, is this charming, three bedroom mediterranean villa. 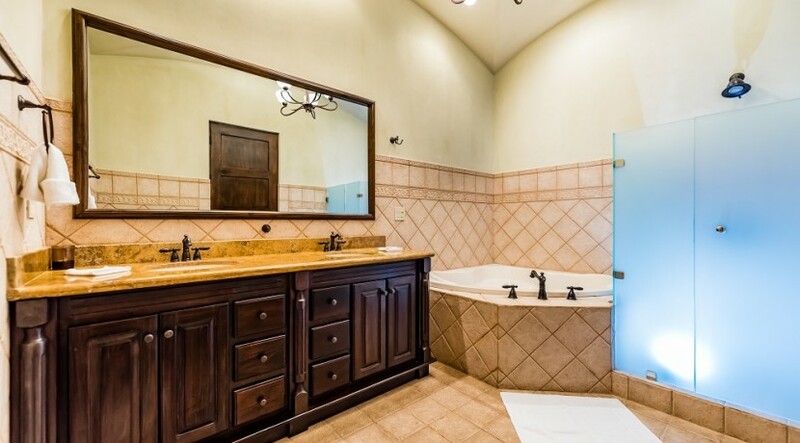 Unrivaled architecture and attention to detail are consistent throughout the area and this home is no exception. 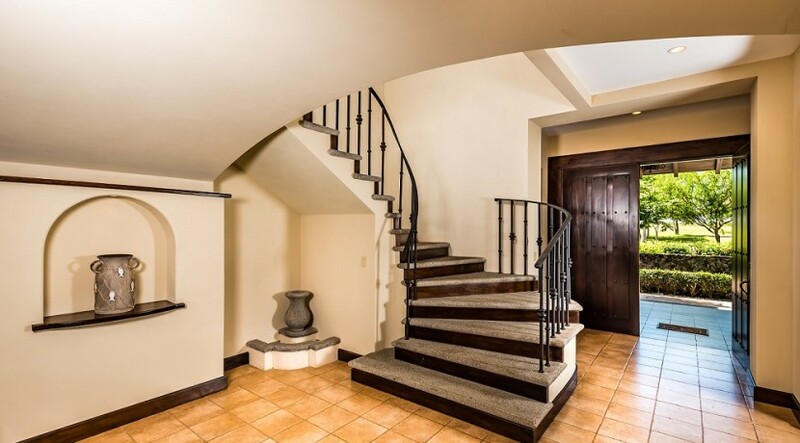 The grand entryway opens up to a spiral staircase and welcoming foyer that sets the tone for the rest of the house. 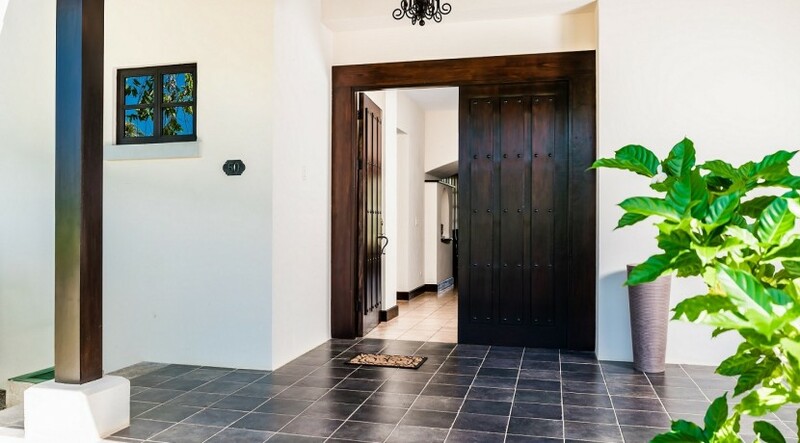 The entrance flows seamlessly into the expansive open-concept living space, making the home perfect for families or large group. 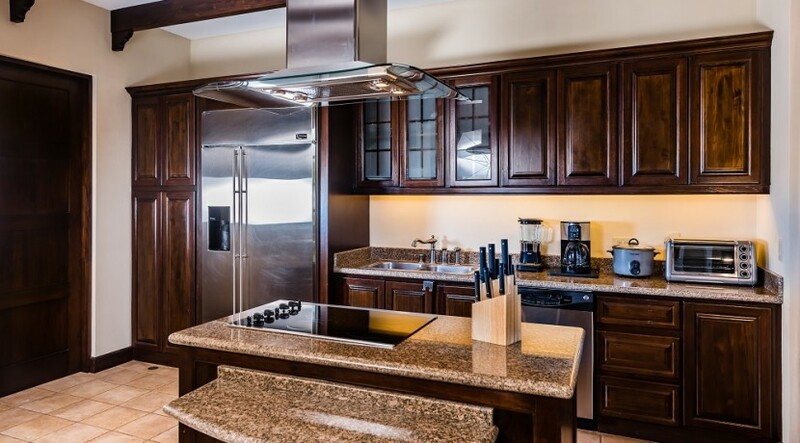 The gourmet kitchen features premium stainless steel appliances and granite countertops. 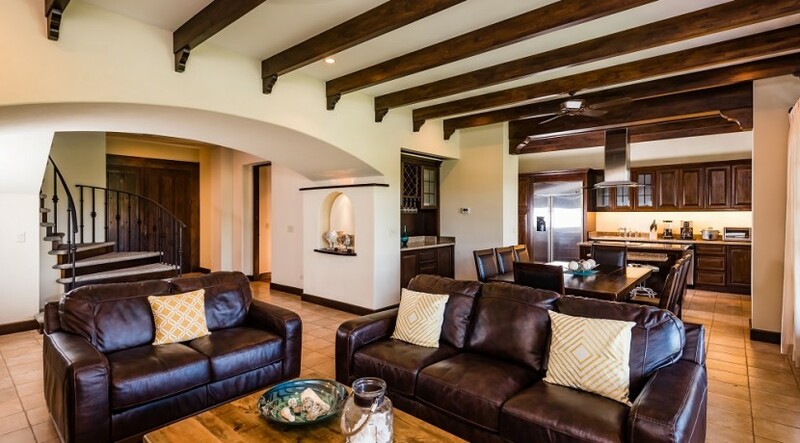 Dark wooden cabinets perfectly tie in the charming wooden beams on the ceiling throughout this first floor. 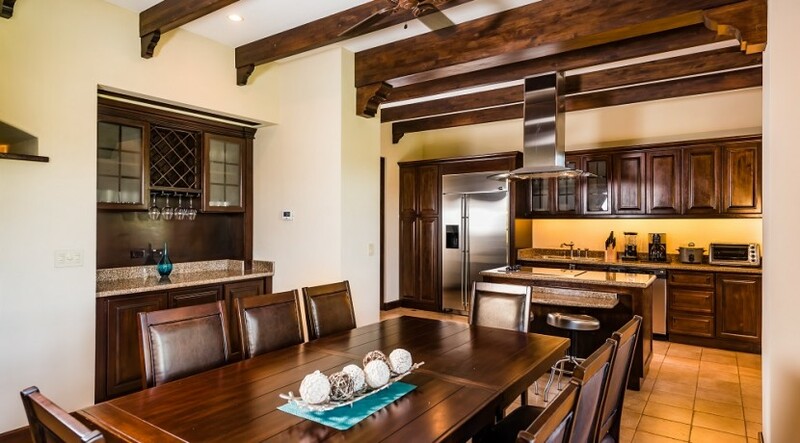 The dining room seats 8 people, is the perfect setting for family or group meals, and keeps the kitchen and living room united. 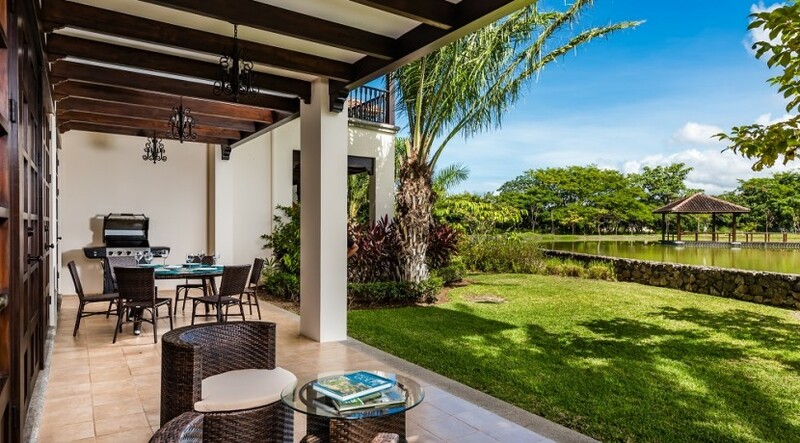 One of the main focal points of the newly furnished villa is the covered outdoor terrace that overlooks a beautiful lake, where ducks and birds are often seen. 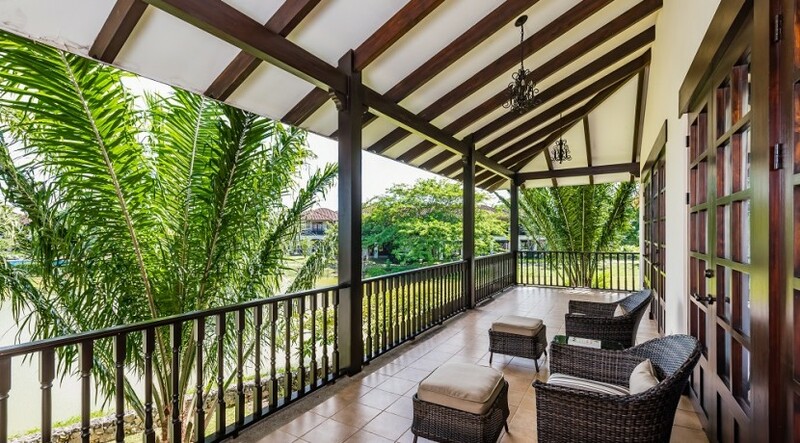 This outdoor living space is ideal for morning coffee, evening cocktails, and of course, barbecues! 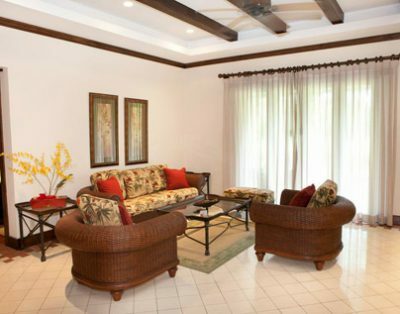 Various seating areas provide options for casual lounging or even enjoying meals outside. 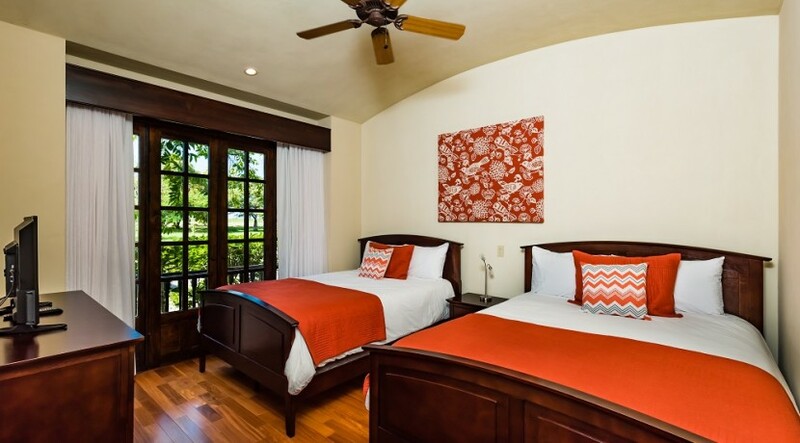 One of the 3 well appointed bedrooms is located on the first floor. 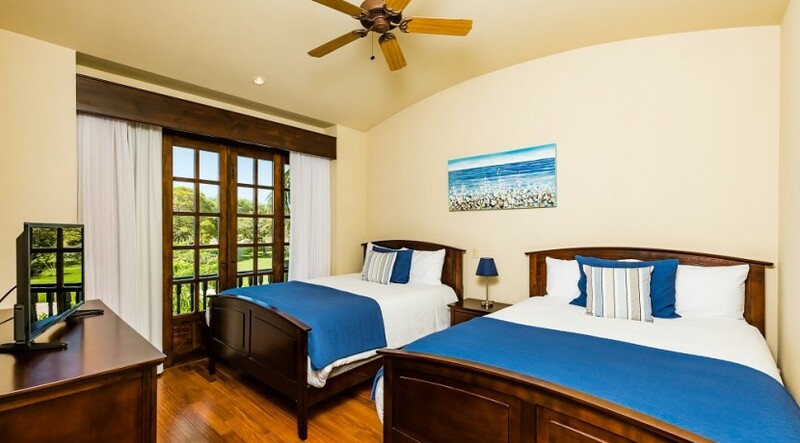 Both guest bedrooms feature two full sized beds, allowing this villa to comfortably sleep 8 guests, each with their own elegant ensuite bathrooms. 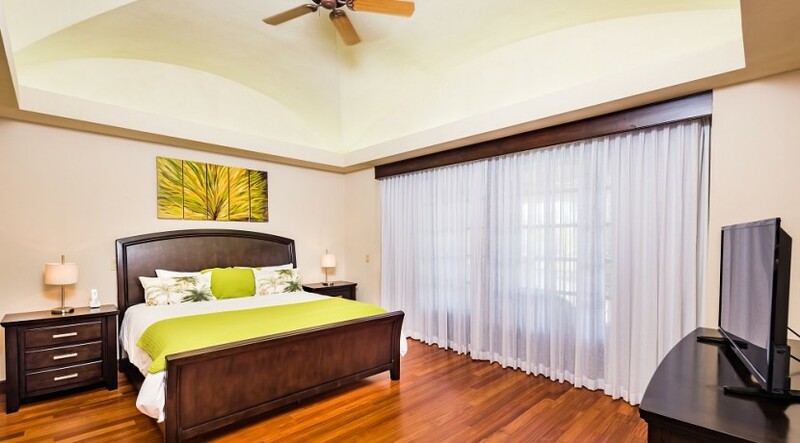 Situated on the second floor is the Master bedroom, the second bedroom, and a media room between them which is ideal for cozy nights in or a separate space for kids to watch movies. 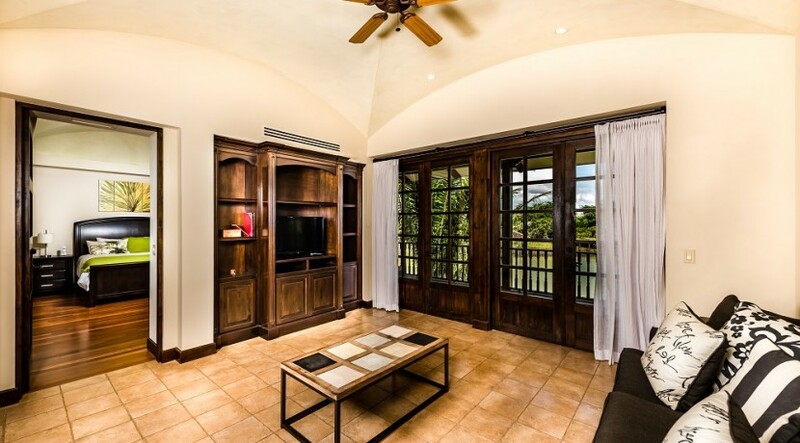 The media room opens up to another terrace that can also be accessed by french doors from the Master bedroom. 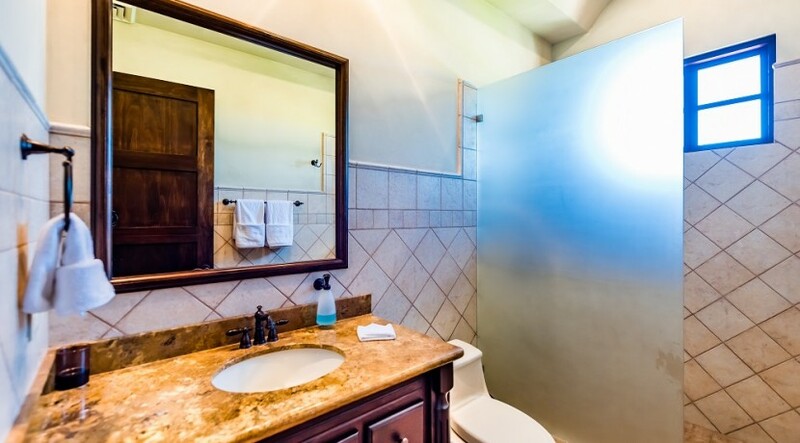 The Master is spacious and boasts a luxurious King sized bed, spa-like ensuite bathroom including a jacuzzi jet tub, a spacious shower, as well as double sinks. 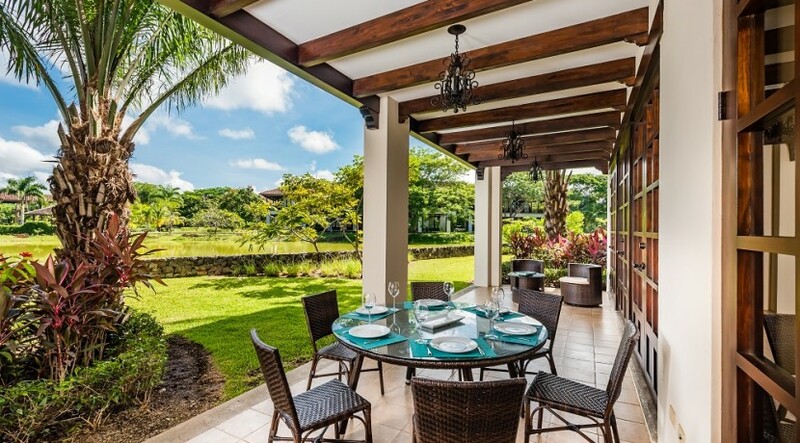 Located in Hacienda Pinilla, Costa Rica, this elegant home sits among 4,500 of beautiful Guanacaste flatlands boasting three miles of unrivaled beaches including Playa Langosta, Playa Mansita, and Playa Avellanas. 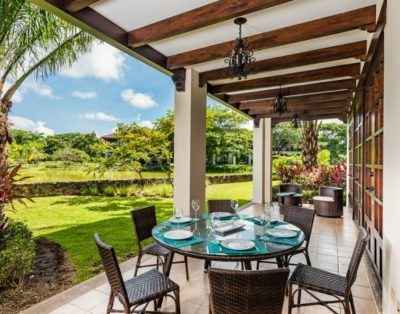 Within Hacienda Pinilla, you’ll find a championship 18-hole golf course, horseback riding, bicycling, jogging trails, tennis courts, restaurants and a private beach club. 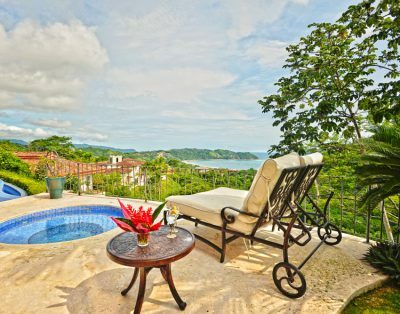 Hacienda Pinilla is also home to the 5 star J.W. Marriott Resort and Spa. 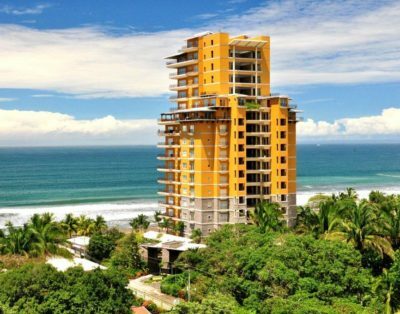 In addition, the property is only 15-minutes away from Tamarindo where you will find, casinos, shopping, dancing and various restaurants. 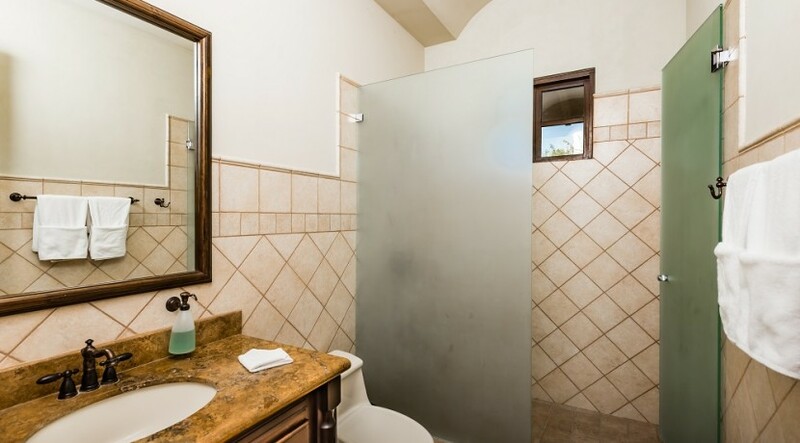 Rates start at $572/night and vary based on season.